Wonderful location for beaches. Bird spot, fish, walk, gardens, a relaxing time! Rock Cottage is a family owned picturesque Cornish home built over 500 years ago sitting between the bridges' of Mawgan and Gear. It stands completely alone in one acre; there are no neighbouring properties within sight or sound, and commands an exclusive and magnificent view down the Helford River. The large terraced gardens wrap the two borders of the private foreshore where the dinghy is moored from Easter to the end of October. For further seclusion there is a waterside woodland in this Area of Outstanding Natural Beauty. Imagine watching the gentle tidal waters of the Mawgan Creek with its ever-changing scenery; see the myriad of river birds that live here - it's a peaceful view, so relaxing and like another world. Set within an enviable location, you have it all to yourself when you stay here! Try fishing for Sea Bass, enjoy wild swimming, launch your SUP's and kayaks from here whilst discovering the bird life living along the oak wooded shoreline. Children enjoy playing hide and seek in the woods and have enormous fun crab fishing from the jetty. Throughout our 65 years of ownership, Rock Cottage has been renovated and extended. Many improvements have been made and it continues to provide excellent accommodation to suit couples or a family of six. The interior is beautifully decorated, enhanced by modern facilities, equipped to high standards with quality furnishings throughout; this holiday home is well cared for. Choose Rock Cottage for your stay; it is most comfortable, warm and inviting with wonderful river and countryside views from each room. Our many excellent reviews from previous guests, say it all! With full central heating by radiators, three bedrooms, including the separate Garden Room, it comfortably accommodates up to four adults with two children. Couples are attracted to Rock Cottage and many return frequently. The modern kitchen/diner is light and has the bonus of a fabulous view down the river from the large picture window. Relax in the luxury sofa and arm chairs in the newly carpeted and beamed lounge. At the far end of this room is a fine wooden staircase which leads to the landing, master and children's bedrooms. The upstairs has beautiful pitch pine wooden floors. Situated on the ground floor of the cottage is the well fitted bathroom. Across the courtyard is the spacious and beautifully presented Garden Room, which sleeps two persons. There is private off lane parking for up to three vehicles and upon arrival, you will find this exceptional property beautifully presented, very clean, with easy to use facilities and everything in its place. Some guests prefer to leave the work place behind, but for those who need it, there is a fast and reliable internet service provided and included in the rent. Rock Cottage is personally prepared by the owners, Linda and Robin. Early spring is a wonderful time to stay at Rock Cottage. The garden and grass banks are full to bursting with thousands of Cornish primroses, spotted orchids and English bluebells. Daffodils grace borders and pots. Outdoor seating is provided so you may enjoy a different aspect whilst the patio is perfect for your breakfast or BBQ. The grounds are planted with camellias as well as hydrangeas, and when autumn approaches, the beech, ash and oak woodland reveals another splendour. Christmas in Cornwall is a magical time, and a stay at Rock Cottage will be cosy, peaceful and comfortable. Throughout the years, many guests have enjoyed the festive period here, taking long walks along the beaches, ambling through the nearby woodland at Frenchman's Creek or simply watching the water and bird life from the cottage kitchen windows. There are numerous villages to visit, all lit up with spectacular displays, and the City of Truro is a good place to do your Christmas shop. Of course, you can do this more locally in Helston, and experience their wonderful Christmas street illuminations. An evening visit to Mousehole is always on the "must-go-to" list. Rock Cottage has an excellent location for visiting many places on the Lizard Peninsula. Family holidays, special occasions, anniversaries or a couple wanting to escape from the daily routine, choose this haven. Just 10 minutes by car and you will reach some of the areas finest beaches for swimming or body boarding - we are spoilt for choice! Gunwalloe Church Cove, Dollar & Fishing Cove, Poldhu, Polurrian, Kynance Cove, Kennack Sands, Coverack and Cadgwith are all favourites. "Memorable, relaxing, so comfortable, everything in its place, very clean and well-appointed with great attention to detail, just perfect ..... simply a wonderful holiday," what our guests say and can expect when they stay at Rock Cottage. Hello from Linda Dandy. For me, it is a real privilege to assist with the managing of Rock Cottage which has been in the Dandy Family for over 60 years. On a holiday to the area in 1954, Rock Cottage was ‘discovered’ by Robin's parents, Eleanor (Peggy) and Leslie Dandy. They immediately recognised the special nature of this 16th century cottage and its unique location, which stands alone within an acre of land bordering the Helford River on two sides. Later that year the property was purchased at auction for their retirement. At the time of purchase, the cottage was condemned as unfit for human habitation and was also Grade II listed because it was then the ‘only recorded example of a traditional Cornish cottage built on a projecting rock foundation’. There was no mains water or electricity, so rainwater was collected for washing and oil lamps and candles provided the only illumination. Drinking water was collected from a nearby spring. A comprehensive renovation programme took place and this was completed by January 1956. The main building was demolished to ground floor ceiling level except for the chimney end which was preserved. The traditional cob (mud, straw and stone) walls retained where it was possible. A Bathroom was created from the old Scullery, the Sitting Room extended and a new Kitchen constructed. The Garden Room was formerly a separate cottage and had been altered in the early 1900s to become a Meeting Room for game shooting for the Trelowarren Estate. Both families living in the cottages’ had shared the semi-detached privy with their own pathway to it. This building has been preserved and still exists at the bottom of the garden. It must have been quite tricky to keep a candle lit in order to see where you were going! An 1876 map also shows a boathouse and the original two stone walls of this still remain. The objective of the renovations was to modernise the cottage but still retain its character and originality as much as possible. We believe this has been achieved and many guests think so too. It is a superb waterside retreat and there is nowhere quite like it! Rock Cottage is in an Area of Outstanding Natural Beauty with very convenient and easy access to many of the local amenities. However, it retains a tranquil and idyllic outlook. The Dandy Family are pleased to share the wonders of the Mawgan Creek and the peaceful atmosphere of Rock Cottage with you where a sincere and friendly welcome beckons. Conveniently situated on the ground floor of the cottage is the bathroom, which also serves the nearby Garden Room. It overlooks the rear of the large garden and has opening windows, a full white suite with an electric shower over a deep bath, large illuminated wall mirror as well as an extendable make-up/shaving mirror and electric toothbrush or shaver socket. Luxury toiletries, non slip rubber bath mat, useful handrail, toilet rolls, bath mat, towels as well as large white towelling bathrobes are supplied. A dual purpose tall radiator heats the bathroom and dries towels. Wall mounted fan heater is provided. Wonderful ever-changing scenery. Only a quarter of a mile from the nearest shop and pub with restaurant. Mawgan village has a thriving shop selling local produce and is very convenient. We are so fortunate to have a fabulous pub with a first class restaurant - The Ship Inn. Glorious unspoilt river views, with private fishing, rowing, kayaking available for guests. Rock Cottage enjoys its own water frontage on the Mawgan Creek of the Helford River. Efficient oil fired central heating with thermostatically controlled radiators in all rooms. Supplementary heating is supplied in the Lounge and Bathroom for those who need it. Quality mattresses, pillows, duvets and linen for all beds. For stays longer than a week, all linen and towels are replaced. AEG Washer/Dryer, 7kg wash and 4kg dry load. 1600 rpm spin. New AEG Washer Dryer so no wet washing hanging around. Outside line, and pegs provided. Clothes airer, heated towel rail, radiator rail in kitchen, provided. BT Broadband. Wifi throughout. Fast and reliable and included in the rent. Tea towels, kitchen towels, bath sheets, bath and hand towels as well as adult size bathrobes supplied. Please bring beach towels with you. Beautiful light, long room completely refurbished with a new luxury 3 seater sofa, matching comfy armchairs, and window seats. Bosch dishwasher alongside the sink unit with the option of a quick wash facility. Smeg Ceramic Halogen Hob - fast heating. Full sized fan assisted with convenience oven/grill and a large electric oven. Panasonic - ideal for heating soup, sauces and easy cook meals. Small walk in pantry with slate shelf for chilling drinks. Store groceries in here. Herb & spices rack. Bacofoil, grease proof paper, clingfilm, sea salt and black pepper mills in situ. Arthur Price cutlery. FBC tea set & plates. New Procook white dinner service, gravy boat, jugs, casserole dishes, Poole Pottery salad/fruit bowls. Beer, lager, wine glasses and champagne flutes. The kitchen has a magnificent view and looks down the river. Take advantage of the wonderful view and eat at the beech dining table in the kitchen. Excellent selection of children's books for bedtime stories. Cornish culture, historical information, maps, local walks, novels and large tourist information folder are located in the lounge. Adults and children can enjoy playing swing ball in the garden during the summer months. There is an excellent selection of board games, puzzles and jigsaws in the oak sideboard. The terraced garden is big, steep in places, and wraps around the property. It has a safe area where children may play. Cornish hedge alongside the lane with a gated entrance. Bring your own Kayaks and SU Paddle Boards, store and launch these from our jetty area or they can be hired locally. A 3.5M sturdy rowing dinghy, suitable for 4, is provided from Easter (weather & tide permitting) until last week of October. Selection of lifejackets from baby to large adult size available. A slate patio with large picnic table, reclining chairs, sun parasol and small wooden table. Fabulous view. Golf Club at Mullion (overlooks the sea) or a short course at Helston - both approx. 10-15 minutes by car. Perfect for two couples or a family. Sorry but the property and grounds are unsuitable for disabled persons, the infirm and wheelchairs. Rock Cottage commands a wonderful position looking down the river, and because of this, access to the water is steep and may be unsuitable for some. The creek is reached through the garden or woodland. A useful roped pathway down granite steps lead to a wooden jetty. Out on a running line sitting on the rocky foreshore is 'Peggy', our sturdy 3.5M rowing dinghy. Tide and weather permitting, she is available from Easter up to the end of October. Normally there are 3+ hours of water, either side of high tide and to help plan your boating, a Tide Table is provided. Fish for Sea Bass, Bream and Grey Mullet from the shoreline or in the boat. Kayaks, small canoes and paddle boards can be kept on the jetty. Appropriate beds are made up for your arrival. If you need a dinner reservation for the night of arrival, online shop arrangements, or maybe you would like to order one of our breakfast and supper hampers, just let us know. We are pleased to help. We had a lovely week at Rock Cottage. The weather was kind. We kayaked on the creek and took out “Peggy” the cottages own rowing boat. The local pub that is within walking distance serves excellent food and we ate there twice. There is also a good local store in the village. There is loads to see and do on the Lizard. A great base for a fantastic Cornish holiday. We are delighted to receive your review Loveday which is our 100th on HomeAway! Thank you very much for this. It was a pleasure to welcome you all to Rock Cottage and hopefully you will return to this unique spot on the Mawgan Creek of the Helford River. The cottage has a lovely view overlooking Mawgan Creek which is just beautiful. The cottage itself is comfortable and clean. Unfortunately the cream carpets and pale furniture are accompanied by what only can be described as a rule book. In a rather accusatory tone, your ‘housekeeping deposit’ is threatened at every turn. It may come as a surprise to Linda that I didn’t travel all the way to Cornwall to specifically pour red wine on her sofa. It hardly makes for a relaxed atmosphere when you feel that drinking a cup of tea in the lounge is a criminal offence. There is also a road running right past the cottage, so it is not as peaceful as the advertising promises. You are given fair warning about the layout of the cottage, but I feel it’s worth mentioning that to reach a bathroom from any of the bedrooms involves either going outside or down a very steep staircase, which is not ideal at night. I have stayed in many cottages over the years and have never had an experience quite like this. The view and luxury toiletries are unfortunately not quite enough to persuade me to come back. This review should be disregarded when compared with our 100 good ones. The petty comments are the consequence of the visitor being told that she had ignored the Contract by sneaking a large dog into the property without our agreement or payment. We only found out by accident and can only assume she was hoping to avoid the small extra cost and didn't like being found out. We all enjoyed the stay in this beautiful place. It’s a real peace off mind. House was very clean and all what you need to expect from it. We love it. So good to hear that your first trip to this part of Cornwall was a big success. I'm really pleased to receive your review and thank you very much for this. It's great to know that you want to come back to Rock Cottage and I shall look forward to seeing you again. Thank you Jon and family for your much appreciated review. It was lovely to meet you and really good to hear that you loved kayaking on the creeks of the Helford River. It's no exaggeration - you really do get these wonderful views sitting at the table outside, or even from the big window in the kitchen/breakfast room. We spent a good part of every morning and evening just gazing and looking at all the interesting birds, such as Redshanks, Curlew, Little Egrets, even an Osprey! The cottage itself is immaculate. Everything is new or in very good condition, and it's all there - both filter and cafetiere for coffee, two ovens and a microwave, etc. etc. and lovely bedding. The local pub has excellent food, but you really do need to book in advance. It's a 15 minute walk there, maybe a bit less on the way back as it is then downhill... And the village shop has a lot of excellent local produce. The only possible downside to Rock Cottage is that there is only the one bathroom, downstairs. And if you are in the lovely annex bedroom you have to go across the little courtyard to reach it, but you do have the compensation of lovely views of the creek from your bed! So thank you Linda and Robin, we really enjoyed our stay. It was a pleasure to meet you both and we are delighted you had a very enjoyable stay at Rock Cottage. Thank you so much for your much appreciated compliments, for being super guests and for taking the time to write a great review. Fantastic Place to Relax & Unwind - Wonderful! 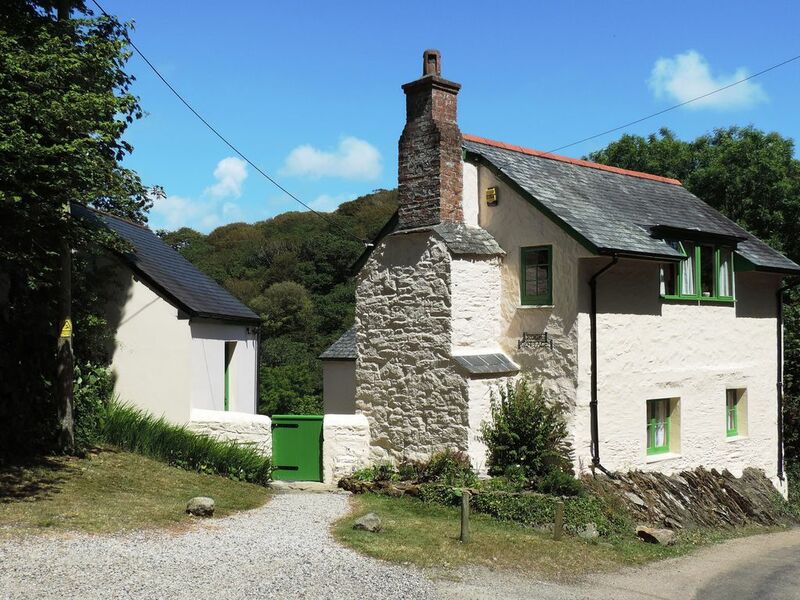 Rock Cottage is a wonderful base for a holiday in Cornwall. The view of the creek at different times during the day will both delight and relax you. The cottage itself is excellent, furnished to a high standard and has everything you could possibly need for the stay, including "Peggy" a rowing boat moored at your own jetty, so you can go out on the creek, life jackets are provided of course. We spent many a happy hour on the jetty catching crabs, and there are hundreds to catch, so no one gets disappointed. Linda, the owner was on hand via phone or email if we needed her and simply let us get on with a wonderful stay, we loved the sweet peas and flowers in the cottage, there were lots of lovely little touches like this. The location of the cottage is great, just outside of Mawgan village and you can easily reach lots of interesting places within a half hour drive, we managed St Ives, Porthleven, Coverack, Goonhilly Earth Station and nature reserve, plus a bit further and you have Pedn Vounder beach (well worth the difficult cliff descent) and St Michael's Mount. The Cornish Seal Sanctuary in Gweek is less than 10 minutes away, and you get to go back for free too. There is a Sainsbury's near Helston , just a short drive away plus Mawgan Stores in the village to, if you want local produce. Give this place a try and you will not be disapointed, we have returned home relaxed and with happy memories of Rock Cottage and Cornwall. Thank you Richard for your superb and very informative review. It was a pleasure to meet you, Jenny and the family and so pleasing to learn that you all had a wonderful stay at Rock Cottage. Crabbing from the jetty is always fun, and rowing Peggy on the Mawgan Creek is enjoyed by many guests. There are of course, many places to visit here on the Lizard, so do hope to see you all again in the not too distant future. Rock Cottage stands completely alone within an acre of private grounds which border the Helford River on two sides and features an unrivalled and elevated panoramic view of the Mawgan Creek. There is nowhere quite like it! Within a short walk from Rock Cottage you will find the thriving Mawgan Stores, your nearest local shop, which is well stocked with just about all you may need during your holiday. On your way you will pass the 12c Church of St Mawgan in Meneage and The Ship Inn. Many of our guests dine at this very popular, well established pub with restaurant or simply stop by for a local ale and then amble back along the lane. Take away fish and chips is available from here too and Mawgan stores sell their frozen meals. In the opposite direction from Rock Cottage, if you cross the ancient stone bridge at Gear and proceed up the hill towards St Martin, you will reach the Gear Farm Pasty shop. The Cornish pasties are made on the premises and are perfect for a lunch time treat. Further on is The Prince of Wales at Newtown St Martin; with very friendly hosts, a big and varied menu to choose from as well as a large garden. Both the Ship Inn and Prince of Wales accept well trained dogs. Children can enjoy the excellent facilities at the Mawgan recreation ground with its newly created play area and picnic seating. Recently installed for the adults, is a state of the art outdoor gym facility - great for a family workout! As well as the Ship Inn, locally there is the New Yard Restaurant and a Chinese restaurant in Mawgan, The Black Swan at Gweek, The Prince of Wales at Newtown St Martin as well as The Halzephron at Gunwalloe and the Shipwrights Arms in Helford. At Porthleven there is Rick Steins Restaurant, Kota, Kota Kai, Amelies, Naughty but Ice, cafes and pubs too. Within a car ride of about 10 minutes is the Cornish Seal Sanctuary at Gweek, Flambards Theme Park and the Helston Folk Museum. Helston Town is worth a visit and has the Blue Anchor inn, one of the oldest pubs in Britain, which continues to maintain a working brewery. There is also a Tesco superstore, Sainsbury's and Lidls. During the main holiday season take the foot ferry from Helford across to Helford Passage and then visit the fabulous gardens at Trebah or enjoy a spot of lunch first at the Ferryboat Inn. Do a coast path walk around Lizard Point where you may see Seals, Basking Sharks, Dolphins and the Cornish Choughs. Safe and sandy beaches to visit at Poldhu, Kynance Cove, Gunwalloe and Polurrian; fishing coves at Mullion and Cadgwith. Historic NT properties and gardens at Glendurgan, St Michael's Mount, Penrose Estate and Trengwainton. Other gardens to visit are the Lost Gardens of Heligan and the Eden Project. Falmouth is a great choice for a day out with the Maritime Museum, Pendennis Castle and of course boat trips to St Mawes. St Ives and Newlyn is a must for art lovers. If you have been following the Poldark series, you may like to see some of the mines where filming took place at Botallack to Levant. Whilst heading out this way, go to Lands End and stop off at Porthgwarra beach - it's beautiful! During your stay we can help you if you wish to book horse riding, sailing, kayaking as well as the thrill of a deep sea fishing trip. Rock Cottage has easy access to an area which has a great number of things to do with a good choice of pubs and restaurants to suit all occasions. We will accept a maximum of two obedient dogs at £35 per pet per week or £5 per day but only when there are no more than four persons staying in the property at any one time. For reasons of hygiene and consideration of other guests, dogs must be kept out of all the bedrooms, including the separate Garden Room, the newly carpeted lounge, and kept off the furniture. A dog gate is supplied. Please ensure you download and read the Rental Agreement for Rock Cottage, paragraph 7 before you decide to book. Our rates include: * Electricity * Central Heating Oil * Quality Bed Linen * Bathrobes * Bath Sheets, Bath Towels, Hand & Tea Towels * Luxury Toiletries * Household Essentials to get you started * Broadband (wifi) * Change of Linen and house clean for stays longer than 7 nights * Rowing Dinghy and Life jackets * Dog Gate * Baby Equipment: Bath, Changing Mat, Travel Cot and Highchair.